I STILL CALL AUSTRALIA HOME! at News Aboriginal Art Directory. View information about I STILL CALL AUSTRALIA HOME! No – not a spangly sing-along with Peter Allen, or an ad for Dubai-bound Qantas. But part of the provocative title - My Country : I Still Call Australia Home - of the largest ever show of contemporary Indigenous art at QAGoMA in Brisbane. Three hundred works by 116 artists cover the outsize walls of its Gallery of Modern Art – unseen by me as yet, admittedly, but much considered. For, of course, Brisbane is the base for those uber-provocateurs, the proppaNOW collective. And that's reflected in a show that's mainly from the Queensland gallery's own collection, which naturally shows a bias towards its own State. And curator Bruce McLean may have tried to maintain a balance on the walls and floor of great remote art from across the North of the country with Blak political art from the cities, but his preference shows in the catalogue. It's almost entirely about the politics. Interestingly, a conversation with the Royal Academy in London's curator for the forthcoming blockbuster show of Australian landscapes revealed that a deeply engaged outsider sees a clear distinction between the two genres of Aboriginal art, which she will be showing separately in London. In Brisbane - thrust together, though excluding Arhemland which gets its own separate show called 'Death and Life' - the main distinctionwould seem to be between the anger of proppaNOW artists like Gordon Hookey and Richard Bell and the more sophisticated thinking of Gordon Bennett and Christian Thompson, the playful mind of Michael Cook and the forgiving quality of Bindi Cole. For, despite a theoretical division of the exhibition into My Country, My History and My Life – which seems to conclude that remote, tribal artists only concern themselves in art with their Country, whereas I'd argue that a great deal of their art concerns their lives in Country – most of the History and Life sections are given over to a post-Apology debate between Blak artists. McLean throws his hat down for proppaNOW, “Retaliating against the 'get over it' mentality – as they should”, against the racism that didn't go away with Prime Minister Rudd's Apology. And he's backed by WA curator Glenn Pilkington whose cogent essay posits “the First Peoples of this land versus the leader of a constructed nation”. Photographer Michael Cook would seem to disagree – preferring the 'playful' element in his well-researched and often beautiful images because of the greater possibility of “changing a person's view” that way. 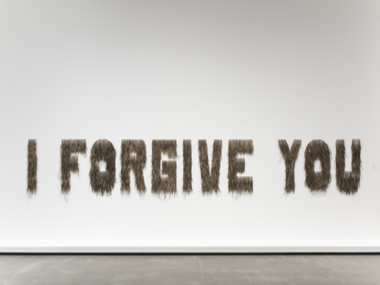 And Bindi Cole's “I Forgive You”, created in emu feathers, definitely “delivers a gentle message of hope like an embrace of a mother whispering into the ear of her child”, as Pilkington poetically puts it. Cole herself explains, “Having been apologised to, it's now my choice to respond – freeing myself from that (pain, bitterness and resentment) by releasing it through forgiveness – allowing me to focus on moving forward and work out how to make the community a better place”. Intriguingly, Gordon Hookey falls on both sides of this fence. His aggressive kangaroos (a self-image)face off the unseen white foe in 'Blood on the Wattle, Blood on the Palm' for adults. But the kids (and QAGoMA always finds great ways to draw the kids in) get their own show based on Hookey's book 'The Sacred Hill' in which the roos put down their arms and sneak through the enemy lines by clever collaboration in order to achieve their goal. 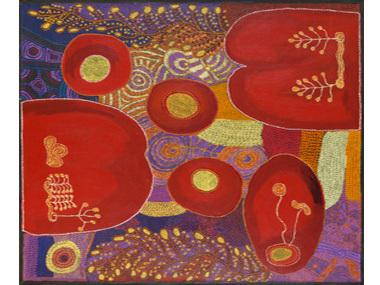 Anangu artists Ruby and Nita Williamson and Suzanne Armstrong also collaborate to show their Country is “alive and full of colour”, not “red and flat” as “some whitefellas” (and a few Blakfellas) mistakenly think. Interesting then that retired curator Hetti Perkins can describe commissioned Brisbane artist Megan Cope as “casting a numinous cartography over the built environment”, when the Williamsons' numinous cartography might have hit her between the eyes! 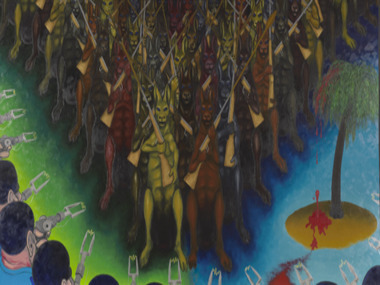 Although new QAGoMA Director Chris Saines writes of an exhibition “drawn from over three decades of research and Collection-building”, the 1984 Uta Uta Tjangala painting is almost a lone representative from the 1980s, with most of the Collection put together in the Naughties. Fortunately pioneers like Gordon Bennett and the late Ron Hurley broke through the reluctance of early curators and donors to buy Indigenous art. Unbought at the time but revealed to me for the first time in the show is the work of the late Vincent Serico. I'll write a separate piece on him.